Zum Strand oder zum Einkaufszentrum Ching Young Village gelangen Sie nach einem kurzen Spaziergang. My family & I have know Hanalei well, and Ileina's Cottage suited us perfectly! We are still basking in the glow of our wonderful stay there, 2 weeks after we checked out. The location is ideal. A very short walk to the cafes, restaurants, shops and grocery stores in town, and a very short walk to the beach. I can't think of a better location within Hanalei, if you want to have the best of both worlds and be able to walk to town or the beach. The layout is generous and appealing, with lots of living space in the main room and on the wraparound porch. The grounds are beautifully landscaped, our kids loved playing in the side and back yards and hunting for geckos. We were thrilled to find a washer and dryer on the premises. There's an outdoor shower for you to wash away the sand and salt from the beach. The house comes very well equipped with all of the dishes and utensils and pots & pans you would ever need, a grill with bbq tools, charcoal and lighter fluid, a host of beach toys for the kids, even a couple of boogie boards and some miscellaneous snorkel gear. I'm sure that inventory of beach stuff comes and goes with each new guest to stay there, but the point is the place is very well stocked and ready for you. Both bedrooms are a nice size and the two bathrooms are both essentially en suite, although one of them opens up onto the the living room as well. I'd say the place is perfect for a couple with young kids who can share a bed, or 2 couples with no kids, or a few friends who don't mind sharing beds. The cottage is adjacent to the larger house property. We were lucky in that the Canadian family staying in the house for the first part of our stay was incredibly friendly, and our elder daughters became fast friends. But the cottage and the house are right next to each other, they share a driveway and yard. The people who moved in after the Canadians left were OK but were not very friendly, and it was slightly awkward to share the space with them and not get any smiles or waves back when they were coming and going. It was not a problem for us, it did not diminish our opinion of the cottage, but it's just good to know how close you will be to your neighbors I think. The ideal scenario would be to rent both the house and the cottage with a larger group, although renting just one or the other is great too. I would not hesitate to recommend Ileina's Cottage. We can't wait to go back! You realize you've picked someplace special even before you arrive at Ileina's Hanalei Cottage. The drive into the Hanalei Bay area is just gorgeous. The bay is a natural gem, and the mountains surrounding the area create unparalleled beauty and drama. The town is a strip of cute shops, restaurants, grocery stores, and some island-adventure outfitters. What a delight to find that the cottage is tucked into a quiet cul de sac just around the corner (easily walkable) from all these conveniences. And the beach is just a short walk in the other direction! The house has beach chairs and boogie boards for ocean relaxation and play in the area with the (handy) washer and dryer. The cottage itself is spacious, with an open kitchen/living area. In the kitchen the appliances are recent/new. Everything is clean and the furniture is tastefully casual -- just right for a beach-town cottage. (Yes, TV and Internet are there for down-time.) The two bedrooms each have an en suite bathroom. Everything is clean, well put-together, and outfitted right. Ileina's Hanalei Cottage was one of three places we stayed on Oahu and Kauai, and it was the one we enjoyed the most -- certainly the best value. 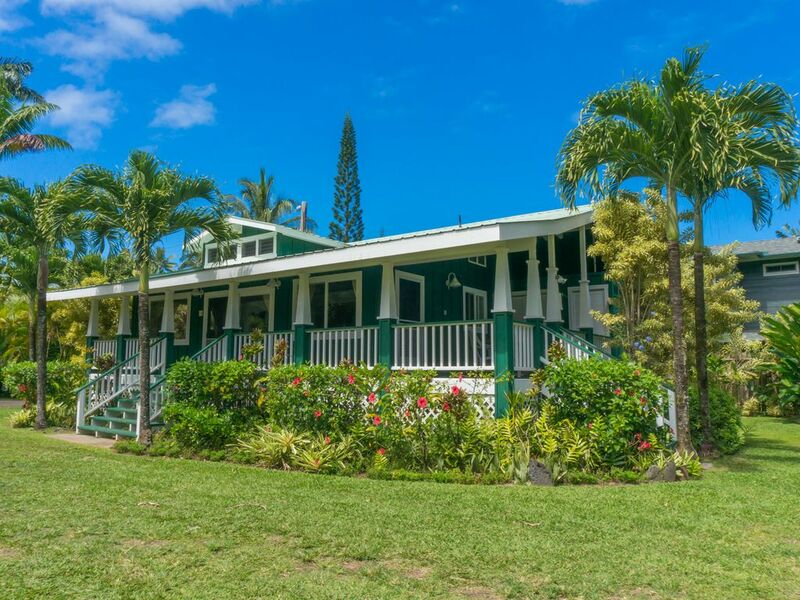 The PERFECT Hanalei Vacation Rental! We have stayed at Ileina's several times--both in the house and in the cottage. Both homes are in great condition and perfect for couples or families. Both kitchens have everything you need to cook whatever you want. There is plenty of privacy with several en suite bathrooms. The upstairs lanai in the big house is awesome, and even the cottage has a very comfortable lanai. All the appliances, including the washer/dryer, worked great, and there were even sand chairs and boogie boards available to take to the beach. But as nice as the homes are, the best feature is the location: you can walk less than 5 minutes one way and be on beautiful Hanalei bay/beach, or 5 minutes the other way to "downtown" Hanalei Town for groceries, restaurants, shopping, etc. We will be back again this year and hope to visit EVERY year! very clean, great location, walk to beach and town. Loved it! We stayed here for 9 nights with our two kids and it was perfect. Great location for walking to the beach or to town for a shave ice or to the farmers market. The cul-de-sac location is quiet and traffic free and the grassy area between houses is great for kids. The spacious and airy interior was perfect for lounging and eating between trips to the beach. We will definitely return.